The family stress adaptation theory explains how families adapt to various stressors. Stress comes from many sources. Internal stress, caused by the behaviors of individuals within the family, contributes to family problems through drug or alcohol abuse, mental or physical illness, or as the result of accidents, to name just a few examples. External stressors may arise from economic problems, such as the loss of a job, natural disasters, such as floods, hurricanes and tornadoes, or violence, including crime and terrorism. While most people try to avoid stress, no family is immune to it. Psychologists seek to quantify and examine stress by means of a theory, and suggest coping mechanisms families should engage in to remain intact and healthy through a stressful event. The term "family stress adaptation theory" refers to the theories of many psychologists. The major family stress model, called Hill's ABCX model, identifies major contributors to family stress, buffers against stress, and agents that cause family crisis. While many psychologists after Hill added to his theory or proposed new theories of family stress adaptation, Hill's remains the best known example. Reuben Hill studied families who survived the Great Depression, and contrasted these families with those families that did not remain intact after the Depression. He developed his ABCX model of family stress and adaptation. Hill theorized that major stressful events disrupt family equilibrium. Like any organism, the family seeks to re-establish equilibrium by using coping mechanism to handle the stress. Stressors cited by Hill and other researchers since Hill include sudden economic hardship, divorce, physical abuse of children or spouses, illness, substance abuse and relapse, accidents and any other sudden onset events. In Hill's model, the letter "A" refers to the event that disrupts equilibrium. Hill cited protective factors at work within the family that help buffer it against the negative consequences of sudden stress. Hill called one of the protective factors "B" and the other "C". "B" factors include internal and external family resources and social support through church, community or other resources. Families with strong social ties prove better able to cope with sudden onset stress than families with poor social ties. Continuing Hill's family stress model, the "C" factor refers to perception. The C factor refers to shared family beliefs and perceptions of the stressor. Hill suggested that if families perceived stressful events positively or constructively, they were better able to copy with the event. Those families that perceived and dwelled on the negative impact of the stressful event had a more difficult time coping with it. The "X" factor at the end of Hill's theoretical model refers to family crisis. If the family does not adapt to the stressful event and copy with it, they may end up in crisis. Other theorists have added onto Hill's original model, but Hill's model has withstood the test of time and remains the basis for family stress theory. His findings and suggestions remain relevant today. Families adapt to stress with either positive coping mechanisms or negative ones. Coping with the illness or injury through directly addressing its impact on the family. This may mean adding wheelchair ramps to the home, for example, to directly deal with a physical condition, or accompanying a family member to the hospital for substance abuse treatment. Families can also adapt in negative ways to stressful events. Stress rarely comes upon families like a clap of thunder, but more like a rainstorm forming puddles; it's not one major event, but the accumulation of hundreds of smaller events that creates the crisis. Because these little events typically do not seem momentous, families sometimes cope with them in negative ways. This is called maladaption. 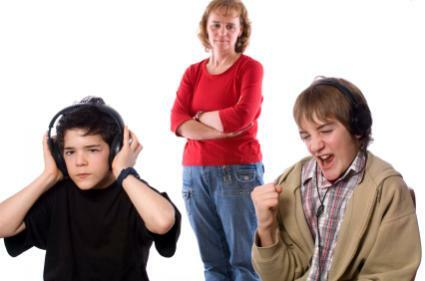 Projecting feelings of anger or frustration onto other family members, as in the case of a mother yelling at her children when in fact she is angry with a situation beyond her control, such as loss of a job. You can nurture good coping behaviors within your own family, using many different techniques. Children are particularly vulnerable to stress, so you may also wish to include relaxation techniques for children. For caregivers such as nurses, doctors, teachers, daycare workers, clergy and others, identifying family stress and supporting families with positive coping mechanisms may provide them with the support they need to avoid crisis.